One of the best ways to replicate your best day on the court is to remember to be grateful for the moment you are in right now. We now have conclusive evidence from MRI scans of the brain and more dependable biofeedback procedures that show how a feeling of gratitude or deep appreciation can impact our entire nervous system, including how our brain functions. The connection between gratitude and the body has exciting implications, particularly as it relates to tennis performance. Feelings of gratitude will almost always have a calming effect that will lower your tension level. Being grateful is acceptance in its purest form. It’s difficult to be worrying about the future, wishing you had a better draw or be angry at yourself for losing the last point, when you become aware of the bigger picture–you’re alive, doing something you love with an opportunity to learn and improve. Being grateful requires us to take a wide-angle view of things. Next time you’re at a tournament, take a step back and remind yourself how fortunate you are to be there. You are most likely relatively fit and healthy, otherwise you probably wouldn’t be competing at all. Ask yourself if you would really want to be anywhere else in that moment. Hopefully, the answer is no! I have trained myself to get into a more grateful state of mind before matches. As soon as my feet hit the floor in the morning I feel myself walking. I am thankful that I have a day ahead of me to run, hit and compete. I reflect on how lucky I am to have this opportunity. This process puts me in a more present state of mind on the court so that everything I do leading up to the match is enjoyable and part of the whole process of competing. I realize that it is not ONLY about winning, even though that is an important goal, too. For me, the match is a gift and I walk on the court with this feeling inside of me. It helps me focus and stay loose. You can do the same. 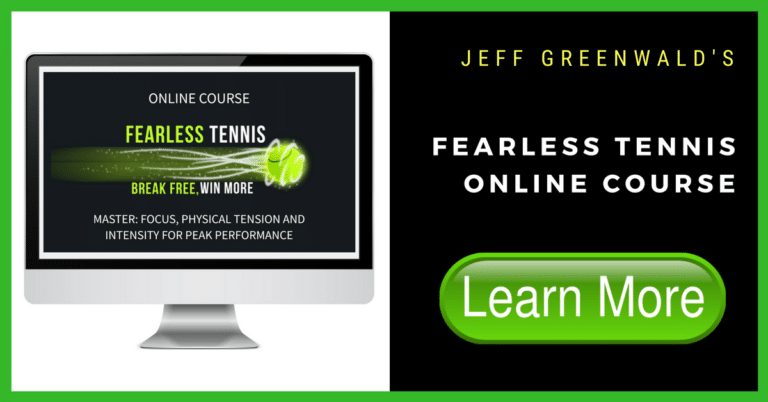 To help you get into a more grateful state take a few minutes before your match or on the morning of your match, close your eyes and breathe while you reflect on what you like so much about tennis and embrace the feeling you have. Recognize that today is another day to improve and enjoy doing something you love. We’re not taking any of our wins or losses with us so do your best to enjoy the moment and embrace the challenge before you. This is a mind-set that can be strengthened and one that is available to you if you choose to access it.